PROPERTY DESCRIPTION: 6.9+- acres just east of the Haverhill Rd and Towanda Ave intersection. Close to Butler Community College and the BG Products Veterans Memorial Stadium. Multi-Family housing, parts retail, and commercial/industrial use on all sides. PROPERTY DESCRIPTION: 11 finished residential lots on Topeka St, Emporia St, and Santa Fe Ave. All lots are located in blocks A, B, & F of the Adlesperger Addition. No Special Taxes!! These lots will be offered individually. Lots 10-16 on S Emporia are zoned for duplex use. EARNEST MONEY: $1,000 per lot. PROPERTY DESCRIPTION: 20 unfinished lots, 10 of which already have paid sewer. These lots will be sold as 1 parcel. Visible location along the SW Trafficway. Beautiful area with mature trees. All lots are located in Blocks C, D, & E in the Adlesperger Addition. 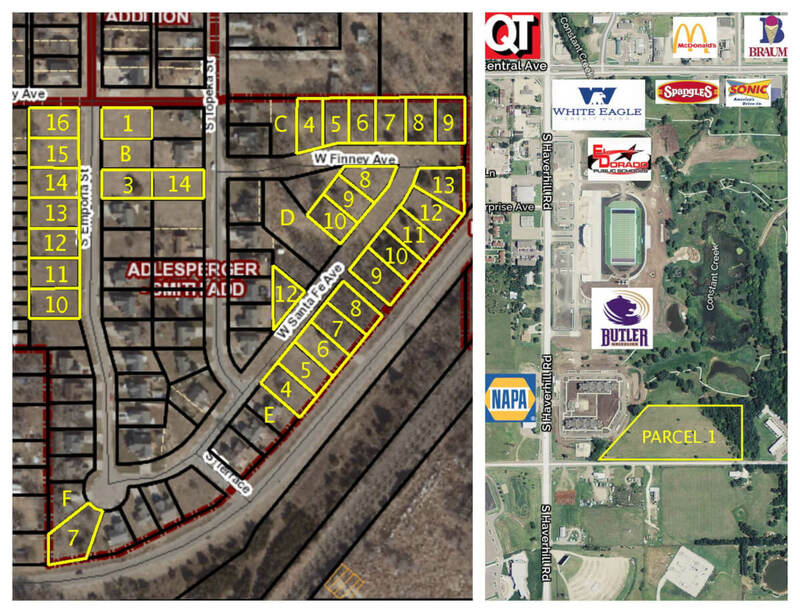 OPPORTUNITY 360 ZONE: The majority of these lots lay in an opportunity zone designed to offer added incentive to investors looking to divert capital gain liability. Please review the following documentation for additional information. LEGAL DESCRIPTIONS: Please call Sundgren Realty Inc for legal descriptions. TERMS: There will be a 10% buyers premium added to the high bid to determine the contract price. Earnest money is specified above and due at the conclusion of the Auction with the balance due upon Sellers submission of merchantable title and closing. Closing date shall be on or before November 16, 2018. Closing fee and title Insurance fee will be split 50/50 between Seller and Buyer. Selling subject to easements, restrictions, roadways and rights of way. This property is not selling subject to financing or inspections. Interested buyers need to view the property prior to the date of the auction and have financing available and any inspections performed prior to bidding. All pertinent information is available upon request. All announcements made the day of the auction take precedence over any other announcements or printed material.